How can I create good hair physics in my MMD model that I am making from scratch using Blender and PMXE? Tell me about the Knife tool in PMXE. Before we get started . . .
MigitsumasenIK and HidaritsumasenIK are identical, down to limiting the angle the way Bandages told some person to do in dA comments that I was lucky enough to stumble upon. Remember, the left leg works perfectly. The right leg doesn’t. But even with pasting all of the information panels side by side, I can’t find the difference! 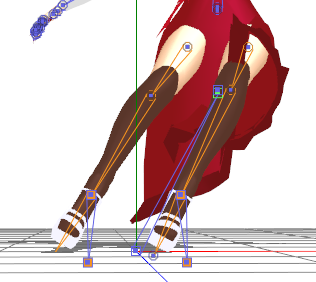 By both verifying that the Target and the IK are in the same place via the bone panel and making sure her feet are in their “default pose” in transform view . . . I got rid of the possibility that the location is the problem. 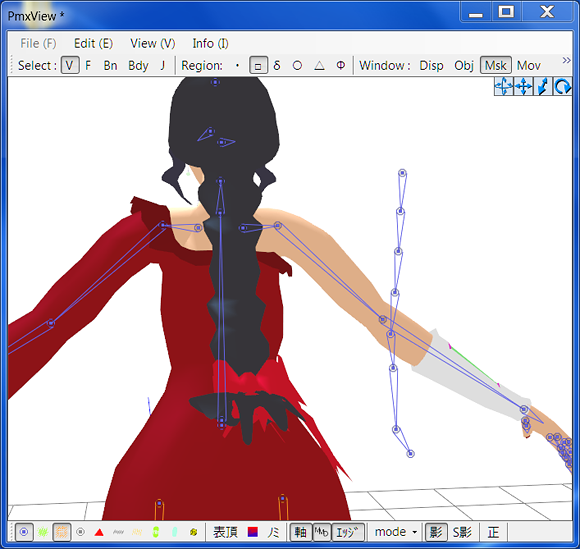 I think I’m going to be a big dummy and delete her right IK bones and redo them via mirroring to copy the correct settings. As a note, if you wish to mirror bones . . . Make sure to not include any invisible bones. Sometimes it will work . . Sometimes it won’t. And I don’t know why. Here’s another thing that I don’t know why it is . . . This time, her target bones were mirrored as well! Let’s weight the bones we just added. I did it!!! I DID IT!! But here’s something oddly demoralizing about PMX. At first glance, there was literally nothing wrong. Actually, at close inspection, there was literally nothing wrong. So, what did mirroring the bones do . . . ? I don’t know, but it’s fixed! So let’s move on. Yes! Yes . . . Of course . . . Let’s get on to physics. In the last installment, I showed you how to add bodies. I hope you didn’t “nope out” before that point, because we’re just going to assume you have them right now! 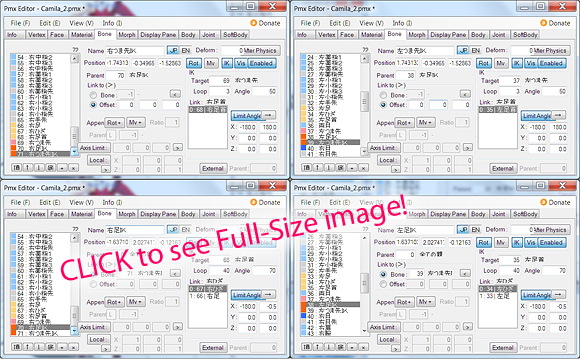 So, if you have the English version like me, it’s up near all of the other buttons that make the weight and masking box pop up, and it is labeled “Adv”. Click that, and it will pop up. Now, if the tutorial that showed me how this worked wasn’t lying . . . 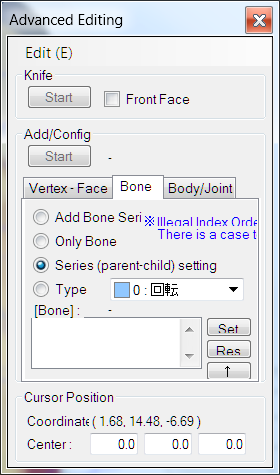 Choosing the series setting in the bone tab will allow me to plop down all of the bones I need without having to actually having to parent / child them. Before we get started, let’s go down to the bottom of the view window and pick the green thing next to the blue for bones circle. . . . It goes away after you start the plopping down of the bones, but it’s nice to have a basic idea. We want to make sure that each bone is weighted to at least two edgeloops. I have no proof for why that would possibly be better, but it just sounds better. How would physics help ya if each bone only had a tiny bit of hair to control?! Let’s mash start on the advanced editing window and start plopping down bones. It almost seems as if this software is purposefully obtuse! Just select that chain and shimmy it into the right place. Before we add physics, let’s weight the braid. 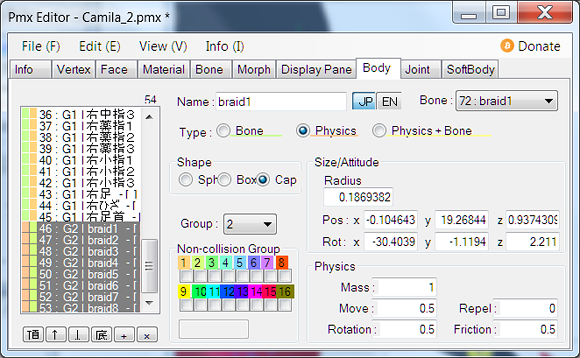 Then let’s change the name from the default new bone name to “braidx” with the “x” being the correct number. Make sure to parent the first bone to the head. 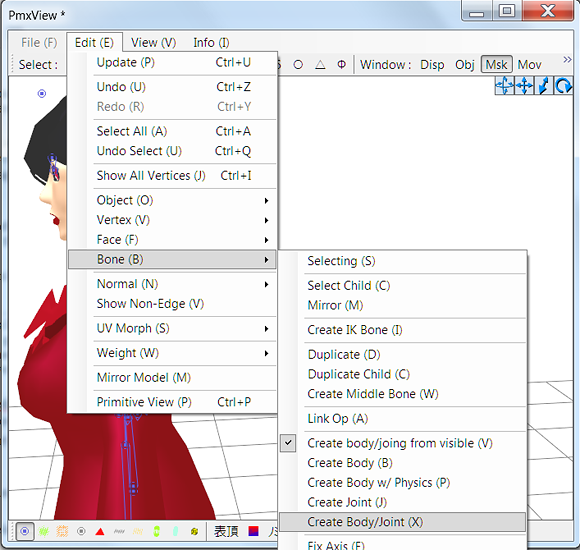 Now, let’s select all of those bones and go to “Edit > Bone > Create Body / Joint”. Now, go to the “Joint” tab and make sure to fix the first joint. As of now, it’s connected to nothing. Make sure to connect it to “頭”. 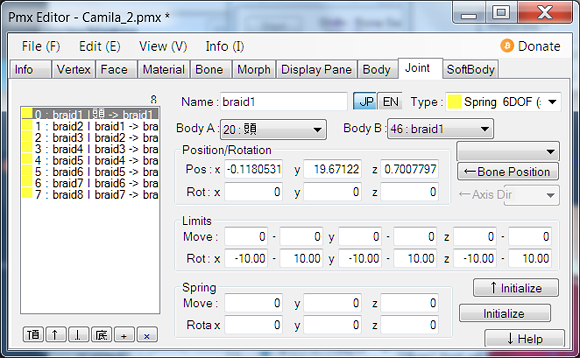 Now, let’s jump over to the “Body” tab and select all of the braid bodies. We want to set this to any group that isn’t already used. We’ll just use two. Now . . . We can test. Pull up the Transform View. To turn on real time physics, mash the yellow triangle up in the transform view toolbar. If you followed my instructions . . . you should have a twitchy mess. If you didn’t, there’s a chance her hair will be on the floor. Remember to link the first joint with the head! Now, let’s try and get her to stop twitching. Let’s go into the joint tab and mash in random numbers. Let’s make the rotate nearly non-existent and the move tab pretty . . . existent. Let’s ask a philosophical question. If every box you are able to put data into is null, should the braid twitch as if it is experiencing a seizure? Then realize you were a big dummy and that the body tab also has control over the braid. 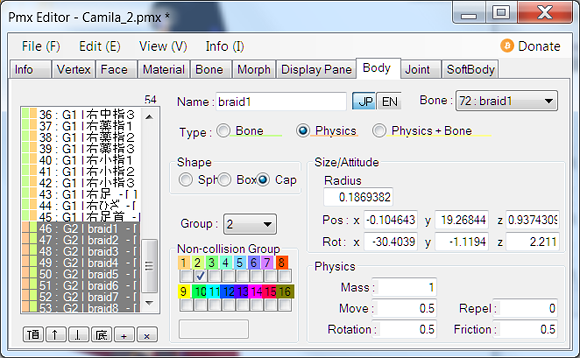 First, set the group the braid is in to a non-collision group . . . Because I’m a big dummy that didn’t think you needed to do it, ’cause, ya’know, hair doesn’t pass through itself! In joint, I set Spring Move to .5 , 1 , .5 just because it seemed like a good idea. You know what else seems like a good idea? Fringe physics. Those tendrils on the side of her face? Let’s make them move with her! Place the bones, weight them, then add the automatic bone / joint . . .
Now, there’s a chance that after doing everything correctly . . . It’s a twitchy mess. That could be because your group 1 bodies are too close to your group 2 bodies. In this case, it would be the head in the way. . . or it might be the last body in the fringe. Adjust the size of the bodies until it looks better. 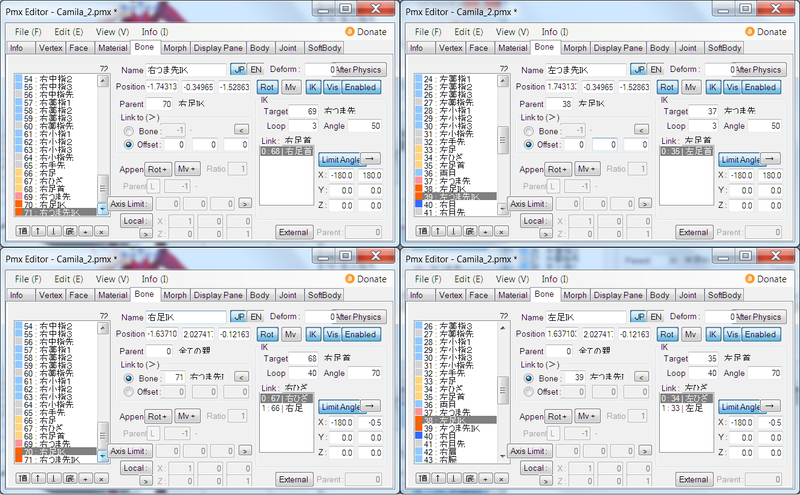 And then mash in random values until it looks good. Hopefully, you’re happy with your result! If you aren’t . . . mash in random values. Now . . . For her bangs . . .
Let’s add a nose body so that it won’t collide with her nose. After adding a nose collider, I tried to use this tutorial for her bangs. After struggling quite a bit, I finally got to a point where I was ready to test it out. Well . . . It’s not perfect . . . But it is close enough! Next time, we’re either going to tackle either the skirt physics, facials, or textures. I’m not sure yet . . . I sent out an email blast to all LearnMMD contributors to see if anyone could help me with the skirt! So tune in next time when we . . . do . . . things?